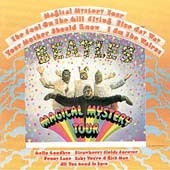 The Beatles "Magical Mystery Tour"
But the fool on the hill . . .
Don't be long - don't be long - don't be long. That was a hit before your mother was born. I say high, you say low. You say why and I say I don't know, oh no. HELLO GOODBYE I say goodbye. You say yes I SAY YES I say no BUT I MAY MEAN NO. You say stop I CAN STAY and I say go go go TILL IT'S TIME TO GO OH, oh no. I don't know why you say goodbye, I say hello hello. In the pouring rain, very strange. From the pouring rain, very strange. One of the beautiful people? What did you see, when you were there? Baby you're a rich man too. You keep all your money in a big brown bag inside a zoo. Happy to be that way.